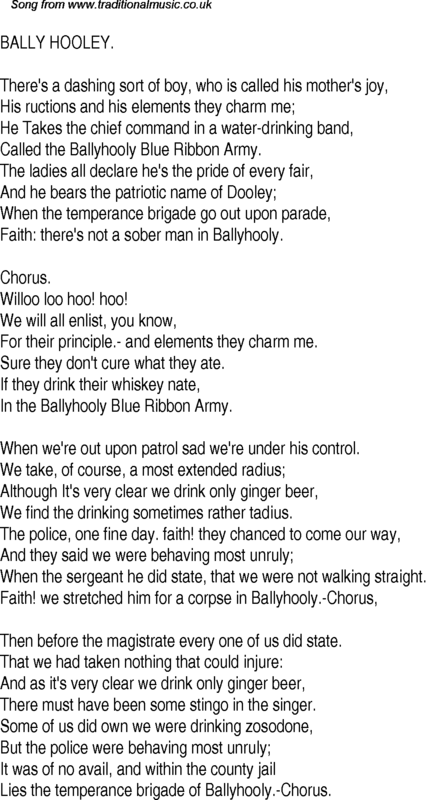 Called the Ballyhooly Blue Ribbon Army. Faith: there's not a sober man in Ballyhooly. For their principle.- and elements they charm me. Sure they don't cure what they ate. In the Ballyhooly Blue Ribbon Army. When we're out upon patrol sad we're under his control. We find the drinking sometimes rather tadius. When the sergeant he did state, that we were not walking straight. Then before the magistrate every one of us did state. There must have been some stingo in the singer. Lies the temperance brigade of Ballyhooly.-Chorus.